Fore Street in the early 19th century. The Half Moon Inn can be seen on the left. This article appeared in ‘The Monthly Chronologer’ in July 1741 and describes in great detail, the last desperate actions of four condemned men. “A very extraordinary affair happen’d at the County Gaol in Hertford, where four highwaymen, very stout lusty fellows, viz Theophilus Dean, Charles Cox (alias Bacon-Face) James Smith and Luke Humphreys, lay under sentence of death passed on them in last Assizes, and were intended to have been executed the following day. Mr Oxenton, the Gaoler who keeps an inn opposite to the prison, went into the Gaol at 4 a clock in the morning, as was his custom, attended by three men to see if it was all safe, and, having lock’d the outward door, sent one of his men down to the dungeon, where the four felons had found means to disengage themselves from the pillar and chain to which they had been lock’d down, and one of them, viz Bacon-Face had got off both his handcuffs and fetters; on opening the door they disabled the man and all rushed out; then coming up the stairs they met with the Gaoler and his other two men, of whom they demanded the keys, threatening to murder them if their request was not immediately comply’d with. Then they forced his men into the yard beyond the hatchway and a battle ensu’d in which the Gaoler behaved so manfully, tho’ he had but one man to assist him, that he maintained the possession of his keys till he was heard by his wife, then in bed, to call out for assistance, who fortunately having another key, ran to rescue him. The fellows saw her coming and demanded her key, threatening to murder her if she offered to assist her husband. By this time, the neighbourhood was alarmed and several persons got to the Gaol door, when Mrs Oxenton, notwithstanding their threats, at the utmost hazard of her life, opened the same and caught hold of her husband who was almost spent, and with the assistance of some persons, got him out and lock’d the door without suffering the fellows to escape. They continued cursing and swearing that they would murder the first man that attempted to enter the Gaol. Highway robbery was rife and Charles Cox (Bacon-Face) robbed Joseph Parsons of gold coins at Sandridge in December 1740. His fellow prisoners robbed a man in Flamstead of clothes, a key and a penknife. 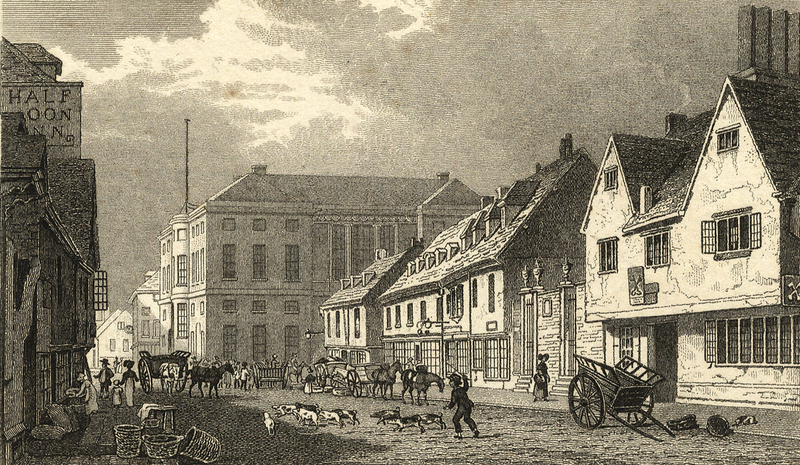 At the time, the Gaol was situated where the Corn Exchange stands in Fore Street and was demolished in 1777. The Gaoler’s house was the Half Moon Inn which became the Dimsdale Arms in the 1830s and is now home to Pizza Express. Prisoners were hanged at the top of Gallows Hill opposite where the old Isolation Hospital stands (now converted) and over the years a few skeletons have been found. After 1800, executions were confined to the Gaol where prisoners were also buried [at this time it had moved to Ware Road]. The last hanging there took place in 1876. How did Bacon-Face have get his nickname? Perhaps it was from having skin pitted by smallpox? We’ll never know…. This page was added on 18/08/2011.